Convert Two Round Prongs To Two Flat Prongs : This adapter allows European (except UK and Ireland) appliances to be used in the United States. 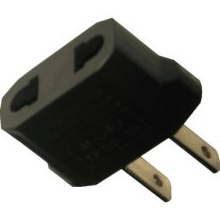 It converts two round prongs European plug to two flat prongs American plug. This adapter can be used safely for supply voltage up to 250V, and current up to 6A.